Explore the world of fangs and claws with Grab Platinum’s VIP screening of Jurassic World: Fallen Kingdom! 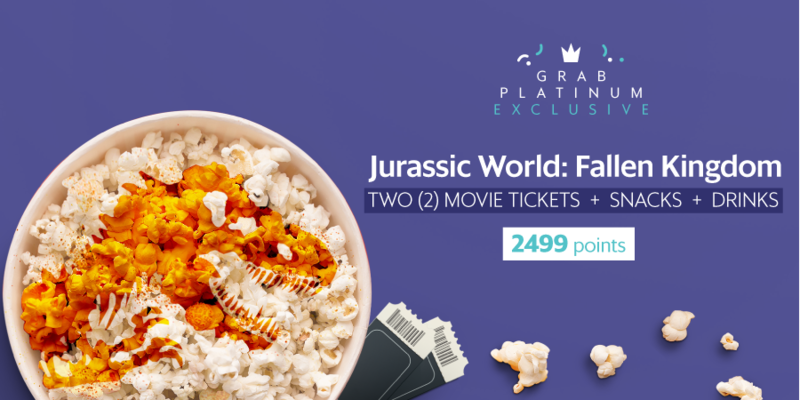 From May 29 to June 4, Grab Platinum users can get two (2) movie tickets complete with snacks and drinks for 2,499 GrabRewards points to the screening of Jurassic World: Fallen Kingdom on June 6, Wednesday at Bonifacio High Street Cinemas! On June 6, go to Bonifacio High Street Cinemas to claim your movie ticket and VIP screening. Grab Platinum user must present the redeemed Jurassic World: Fallen Kingdom reward to the Grab representative for verification. Value of the Jurassic World: Fallen Kingdom reward is 2,499 GrabRewards points. Promo is valid from May 29 to June 4, 2018 or until supplies last, whichever comes first. Each Grab Platinum user can redeem the reward up to two (2) times within the promo duration. Movie tickets that will be issued are reserved-seating.